Sussex Police has been criticised for selling off uniforms on eBay to plug a £26.5million funding shortage over fears the equipment could be used by fraudsters targeting the elderly. 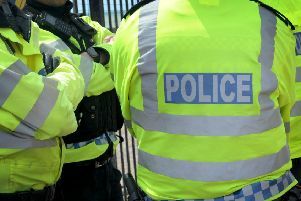 It has listed items including police issue jackets online just weeks after an elderly couple in Brighton were scammed out of £9,000 by two bogus cops. The new and unworn black jacket is described as Sussex Police equipment which is ‘surplus to requirement’. There is also equipment such as UV flashlights and hi-visibility jackets listed for as little £9.99. Police branding has been removed from the gear but Mr McCarthy still fears it makes fraud ‘that little bit more easy’ for criminals. He said: “We regularly see stories about people impersonating police officers as a way to commit scams against older people. “There’s an argument I think the police would make that these items can possibly be found elsewhere if you want to buy them, and we would not want to disagree. “When it comes to things seen to be identified with police officers it seems to be sending the wrong message. “I think they should probably be restricted from selling these sorts of items. “If Sussex Police stop selling these garments today it’s not going to stop people committing these crimes, but why make it that little bit more easy? In December two criminals dressed as police convinced two pensioners, a 72-year-old woman and a 74-year-old man, to hand over £6,000 and £3,000 respectively. They told the pair work recently carried out on their home was done by bogus builders who were now in court. The pair, who were also shown fake police ID cards, were told the cash was needed for court fees. Other listings on the eBay page include items found or confiscated by the force during police raids - such as a Fifty Shades of Grey DVD and dozens of items of clothing. The official selling page shows it has sold 8,540 items, with 99.9% positive feedback. A Sussex Police spokesman defended the force’s decision to sell off the surplus gear. He said: “As these items are assets all the money goes back to Sussex Police towards the running of the eBay shop and back into areas such as the uniform stores. “By selling these items we have been able generate significant income for the force which would not previously have been available as well as being able to save a significant amount on our waste costs. “A large proportion of money generated from seized and found property sold on our eBay shop is put into the Police Property Act Fund, which is divided amongst charities with the rest of the money going back into running the shop. “All money generated from the sale of assets such as ex uniform goes back to the department where the item came from to reinvest, for example to the clothing store. The spokesman added: “Items sold are no longer suitable to be re-used by Sussex Police and all items have any police branding and insignia removed. “Without this branding they are just generic items which can easily be purchased – standard Hi-Vis jackets and combat trousers etc. “We have been selling these items for several years now. He said ‘contentious items’ like armour and handcuffs are never sold online and the eBay site is approved by Chief Officers and the force’s own Professional Standards Department.